Working across domains is a fact of life as a computer and electronic engineer. Solving real computer and electrical engineering tasks requires you to assimilate the vast array of signals and systems concepts and techniques and apply them in a smart and efficient way. Here’s an example problem that shows how analysis and modeling across the time, frequency, and s- and z-domains actually works. This example works across continuous- and discrete-time systems. RC is the time constant associated with the series resistor and shunt capacitor that defines the filter circuit. This problem asks you to find a simple discrete-time filter equivalent. This result indicates that sampling a continuous-time impulse response maps the s-plane to the z-plane via z = esT. (This connection is part of the figure.) For the RC filter impulse response in particular, the pole at s = –1/(RC) is mapped to a pole at z = e–T/RC in the z-plane. Because e–T/(RC) < 1, the pole is stable. Formally, this is called an impulse invariant filter design, and it allows you to transfer a continuous-time filter to the discrete-time domain. In the broader sense, the z = esT transformation maps the left–half s-plane to the interior of the unit circle in the z-plane and the right-half s-plane to the exterior of the unit circle in the z-plane. The jω-axis of the s-plane maps to the unit circle, which is where jω resides in the z-plane. The mapping occurs repeatedly because of sampling theory. Aliasing of the filter frequency response also occurs, unless it’s bandlimited (zero) for f > fs/2. This filter is like h[n] = anu[n] for 0 < a < 1, with the scale factor 1/(RC) and a = e–T/(RC). One detail remains that the design procedure hasn’t taken care of, and that’s ensuring that the filter gain at frequencies is preserved, in particular f = 0. Use Python to take a quick look at the frequency response magnitude of the original analog filter and the digital filter realization. The analog low-pass filter time constant is related to the filter 3dB cutoff frequency (where 20log10|H(f3dB)| = –3.0) via f3dB = 1/(2πRC). 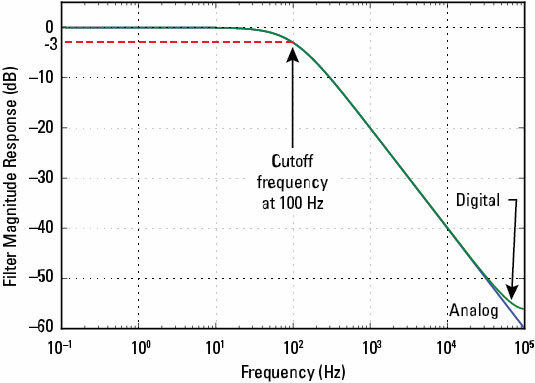 The frequency response magnitude in dB for both filters is shown in the following figure. Note in particular the responses overlap except when f is very close to the 100-kHz folding frequency. The response comparison between the two filters is good. The fact that the digital filter response lies above the analog response near fs/2 is due to aliasing in the frequency response. Alternative digital filter design approaches can mitigate this, but not without some tradeoffs. That’s engineering.